We started walking through town and at one point Karin said to me, “You walk faster than me. Go ahead.” Instead of taking this personally, I thought to myself, she’s right, I do walk fast. We got along great, but we didn’t walk at the same pace, and I like to stop and take photos whenever I have the whim. 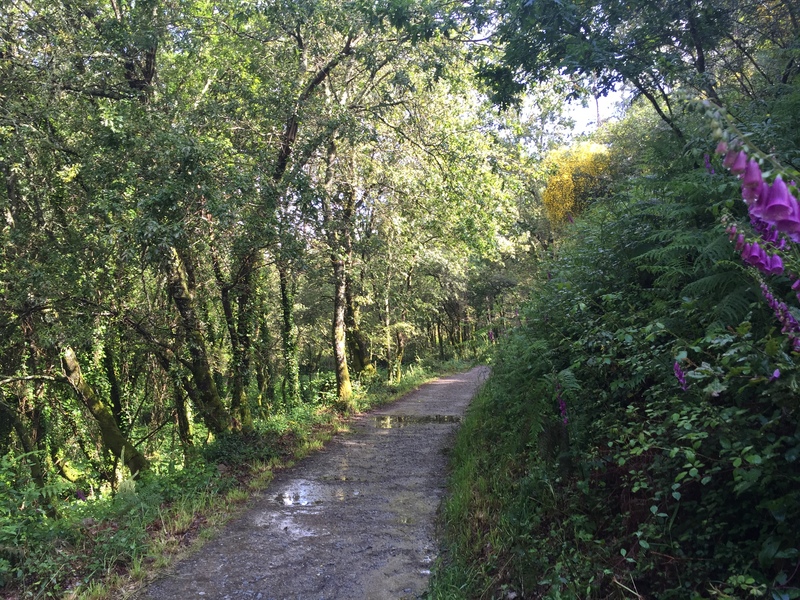 And that’s okay on the Camino – everyone should walk at their own pace. So, I responded, “Okay, I’ll probably see you again along the way.” Sure enough, we saw each other a few times throughout the day, and a few days later in Santiago. I was free to do my own thing, so I went back to the Parador, which was on the way out of town. Since we were in a rush to get back to the albergue the previous night, I didn’t have a chance to get my credential stamped there. 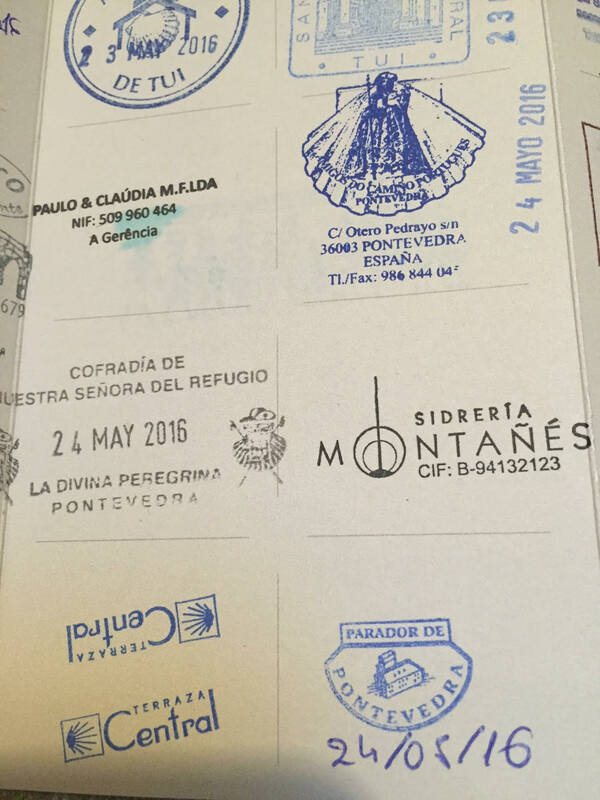 It was definitely one of those Camino highlights that I want to remember with a stamp. After the stamp, I saw Elena from Austria and Rita from Brazil, who I met the night before in the Parador’s bar. They were lucky enough to be staying at the Parador. Elena is a travel blogger at Creativelena and does reviews on accommodations, so she gets sponsors to help pay for her trip. Clever girl! Rita is also a blogger at OPortoEncanta. 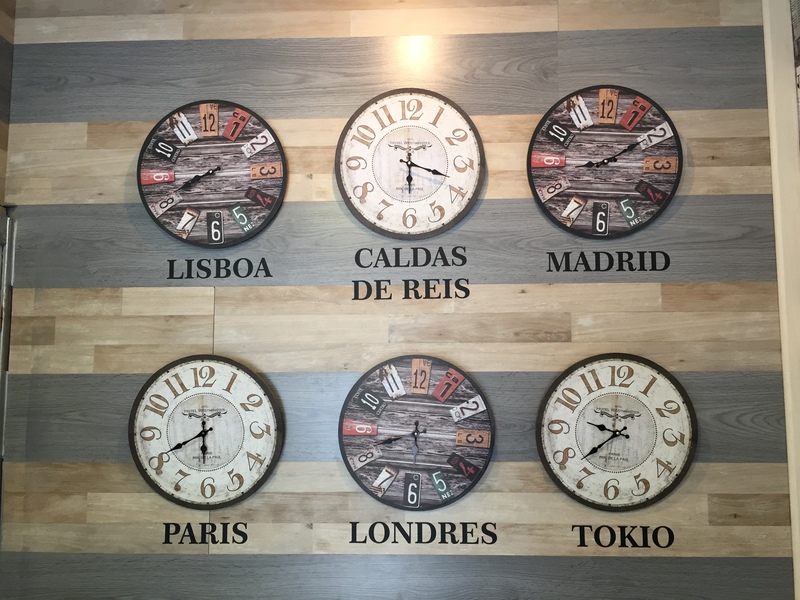 Together they wrote about their experience and shared it with the hashtag, #duasbloggersumcaminho. I crossed the beautiful bridge and enjoyed the morning walk out of town. Construction workers were repairing a walking path on the Camino: it was so cool to see this in action. Here are a few photos. 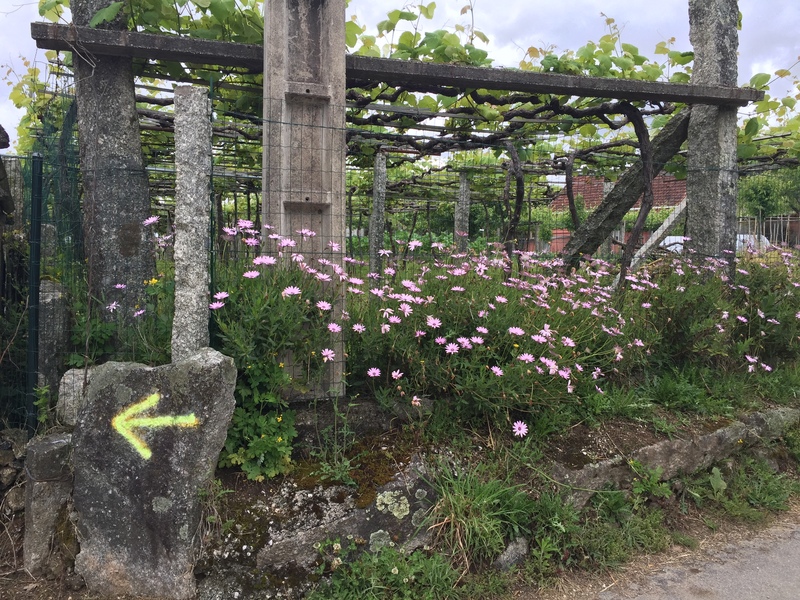 Spain takes care of the infrastructure on the Camino. They realize that pilgrims bring revenue to businesses they pass along the way. It’s a win-win! It was around this point that I realized I had left my cell phone charger and backup battery plugged into the charging bank at the albergue. Doh! I was already about an hour into my walk so there was no way I was going to walk back to get it. Plus, I knew I could replace it in the next big town. For the record, this was the first albergue that didn’t have outlets near the beds. Instead, they had a big charging bank in the dining area. I had my phone with me during the night and was just charging my battery pack there overnight. I’ll admit, I was feeling a little hungover that morning, so I just didn’t think about it until an hour later. It was just another lesson I learned about making sure I had everything before leaving, including what’s plugged in! Instead of worrying, I continued walking through the beautiful woodsy setting. 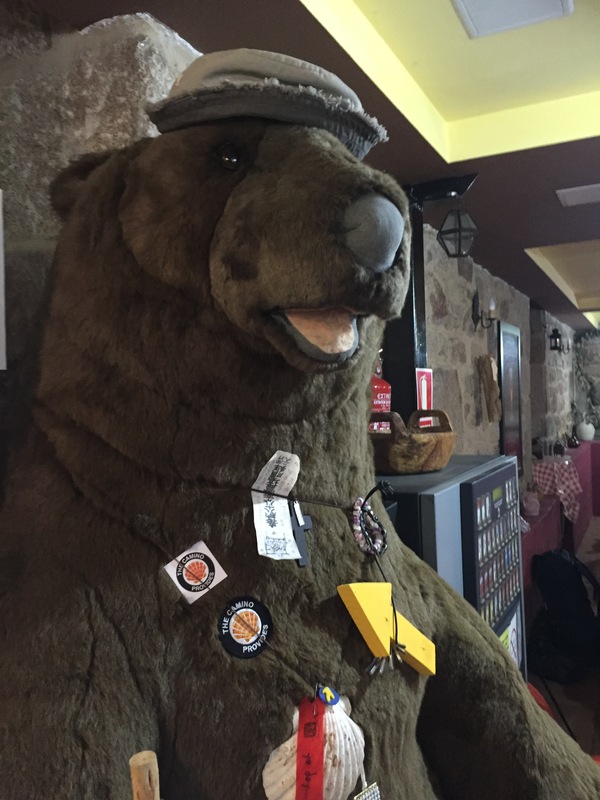 During the late breakfast stop at a charming café that had a big stuffed bear, I ordered tortilla, a banana, zumo de naranja (fresh squeezed orange juice), and café con leche. Next to me, a Spanish-speaking woman was talking frantically about something that she was trying to get help with from the café staff. She had lost her valuables that included her money, cell phone, credit cards, and passport. I couldn’t make out if they had been stolen or if she had left them somewhere. I too would be panicked if I lost these items. The barista was trying to calm her down and was letting her use their house phone. In comparison to her mishap, my carelessness with the cell phone charger was not that important. While losing things can happen to any of us, I did make sure the important stuff, like my phone, cash, cards, passport, and credentials, were with me at all times in my little black purse. The Cafe owner was so sweet for trying to help that woman. I gave her a patch and she put it on the big stuffed bear. If you see this when you pass through, take a selfie with the bear! Ultreïa! This means onward and upward in pilgrim-speak, and was the theme of the day for me and hopefully that woman. Every day I enjoyed walking alongside creeks and rivers. I took a rest break at this bridge and listened to the sounds of rushing water. 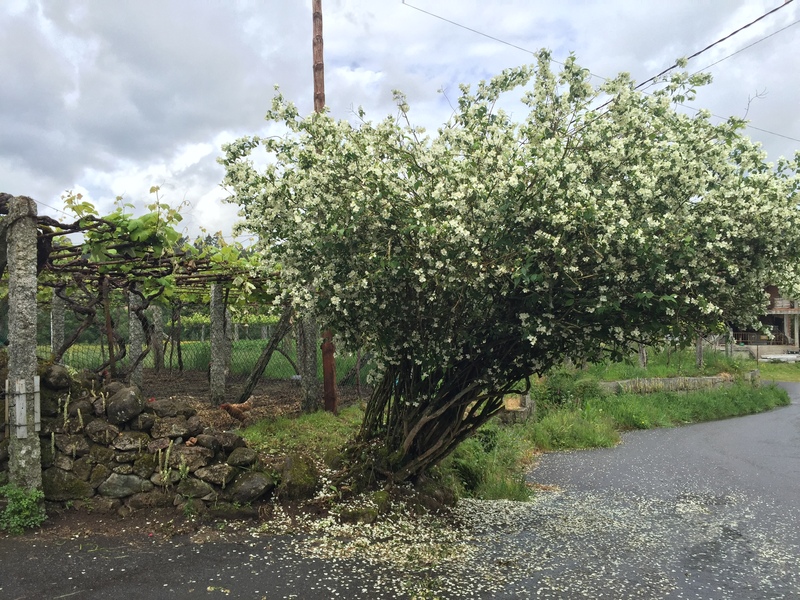 Later for lunch, I stopped at a farmhouse along the Camino that offers meals for pilgrims and house-made wine. When it’s hot weather, I prefer chilled white wine or beer with lunch. When I got my wine, it tasted exactly like the sidra we had the night before! It didn’t taste like wine that had gone bad, rather it was dry with a slight citrus and mineral taste. The effect of in-house fermentation perhaps? Anyway, I don’t like sweet wine so it hit the spot, along with my huevos revueltos (scrambled eggs) and bread. 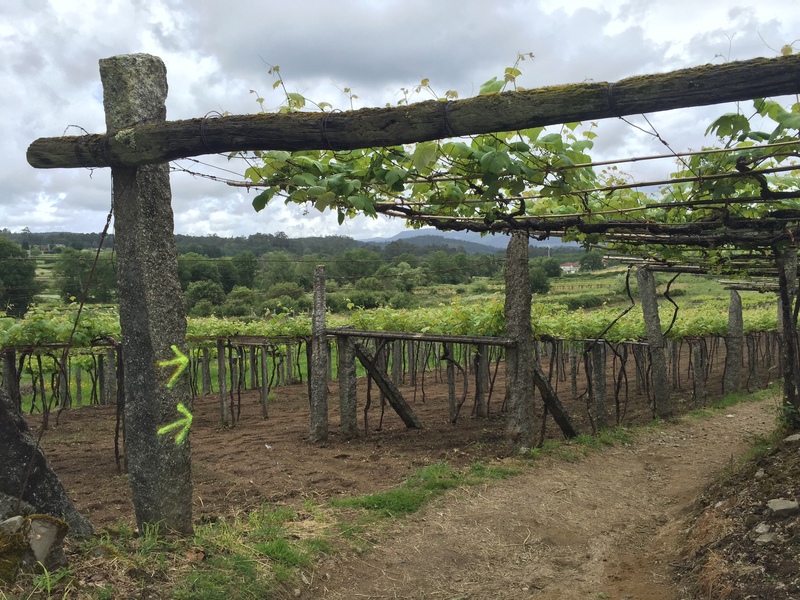 From there the Camino continues through the Albariño vineyards and farms. This herd of sheep and goats caught my attention. The baby goats romping around and butting heads reminds of when young Rudolf and Fireball are playing in Rudolf the Red-Nosed Reindeer, one of my favorite Christmas movies. 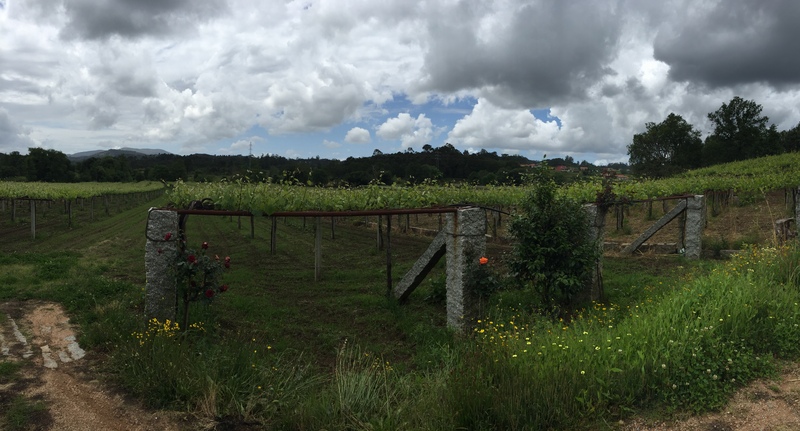 I caught up with a woman I had seen eating lunch at the farm house, and we chatted. She and I walked at the same pace and enjoyed each other’s company so much that we went all the way to Caldas de Reis together. Yvonne is from Germany and had lived in San Francisco for one week with a family for an English program. Like Karin, she spoke excellent English so our conversation really flowed well. We were amazed at how much we had in common. We both have been in our professions for about twenty years and have recently taken to writing more. 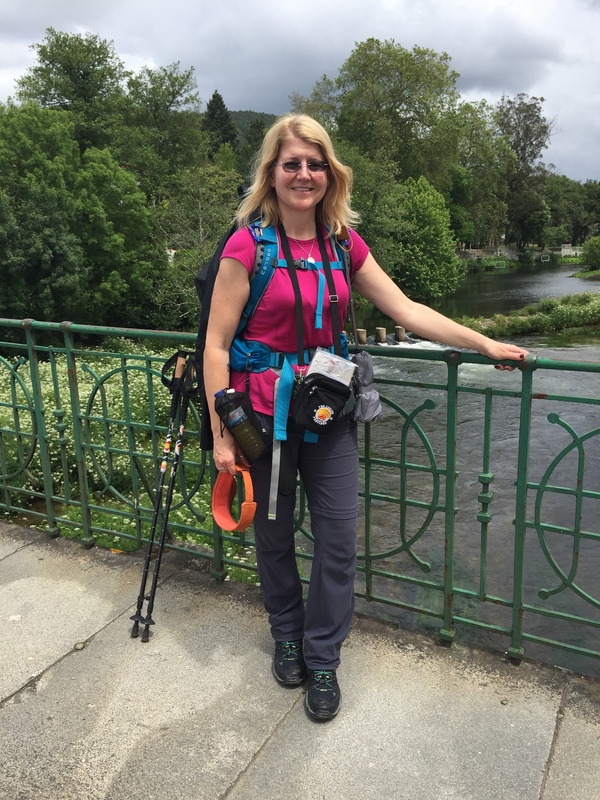 She has a blog about the Camino too! 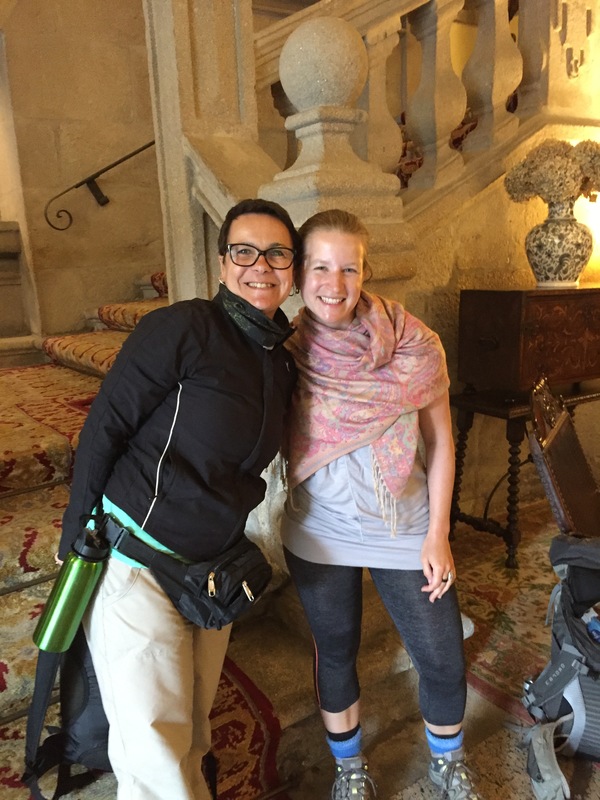 In fact, she recently wrote a guest post on my blog, What the Camino Provides for My German Doppelgänger. 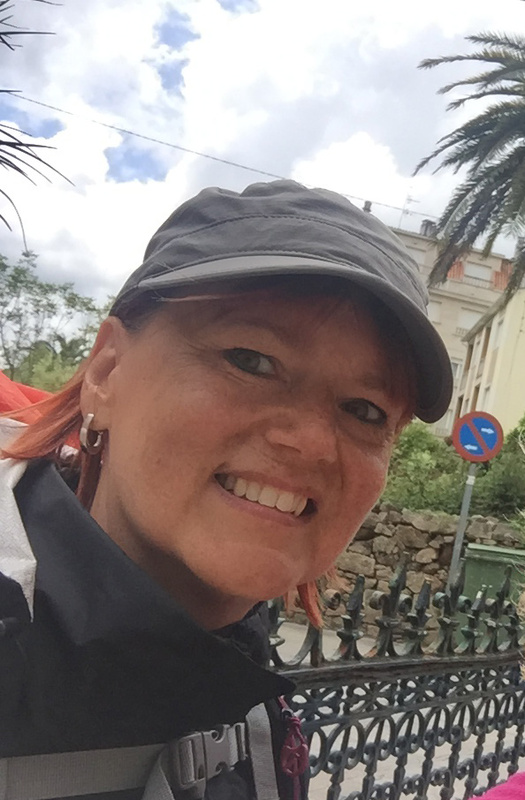 A big difference between us is that Yvonne pre-booked her accommodations along the route. I’ve used booking.com many times for other types of travel, but it’s also a great resource for pilgrims. She wanted to make sure she had a decent place with reliable wi-fi because she brought her laptop to publish blog posts while on the Camino. 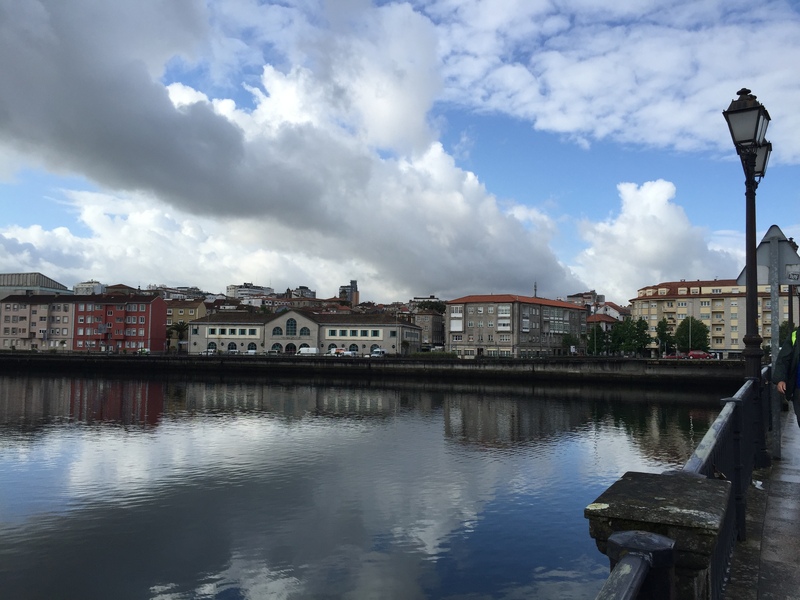 I thought about blogging while traveling but decided not to so that I can fully experience the Camino. My laptop would have been way too heavy, and I preferred being social with people rather than hunkering down in a wi-fi zone. Instead, I posted a few photos on Facebook each day to keep my family and friends updated on my progress. Easy peasy, and my version of a digital detox. 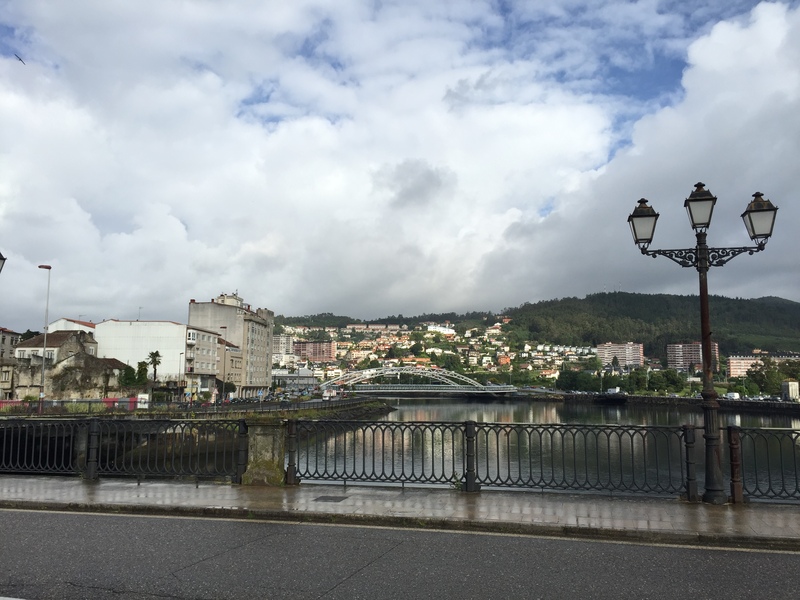 I figured I’d write blog posts when I returned home, and that would extend my Camino experience. It seems to be working as planned! Yvonne and I parted ways, and I headed to the municipal albergue. I asked the hospitalero if there is a way to transport my phone charger from Pontevedra ahead to another albergue and he thought he could help. Jesus was his name, so I said, “thank you, Jesus.” He made a few calls and said it would be at the albergue in Santiago in two days. Amen! With that settled and my bunk bed selected, I showered, did laundry and headed out for a hearty pilgrim meal. 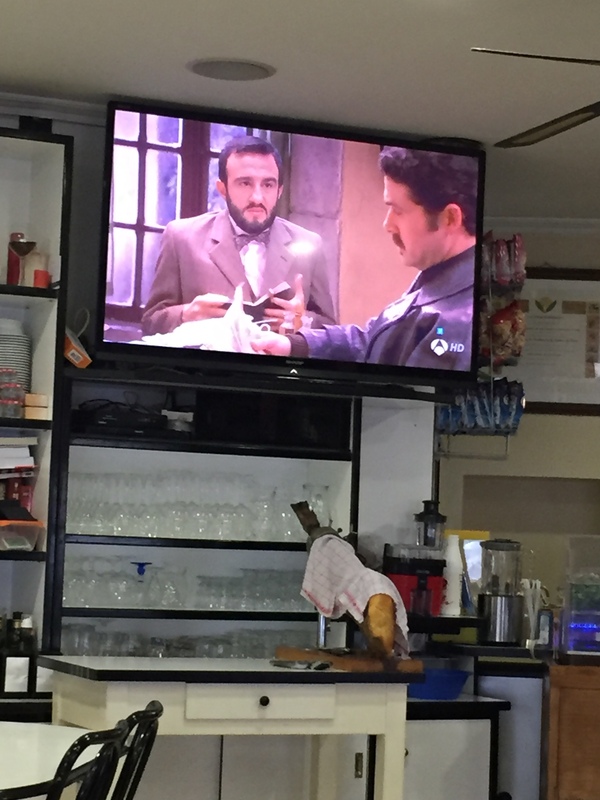 You know you’re in Spain when there’s a telenovela blaring on the restaurant’s TV and a leg of jamón ibérico on a carving rack. It’s good to be back in Spain. I met a couple of guys I saw at the albergue earlier. Miguel, from Boston, originally from Peru; Danilo from Italy; and John from Korea. When they introduced themselves, John said that he’s from Seoul. I joked, “you’re like the Soul Man from the song.” He looked confused, then Miguel and I sang a few lines, and he laughed! John had never heard of that song before. 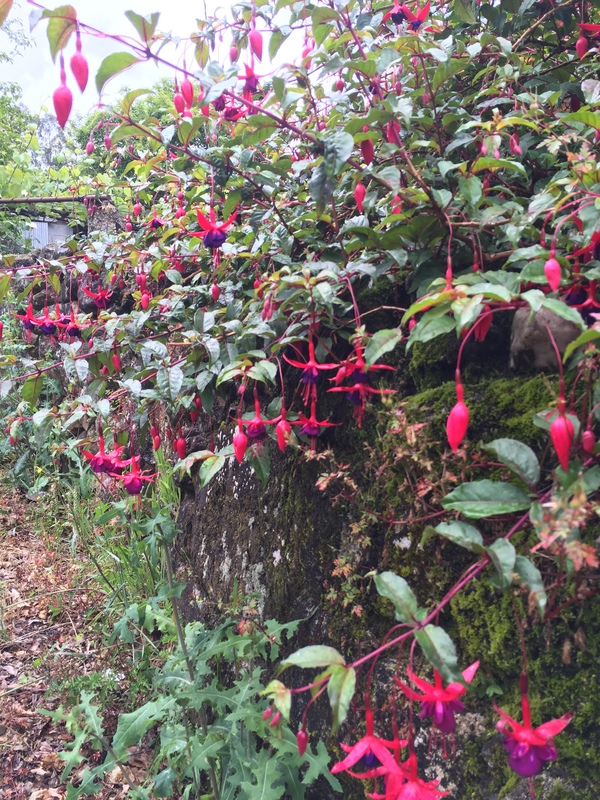 Cultural differences abound on the Camino! After dinner, I stopped at a mobile phone store to replace my charger. They wanted 25 Euros. I found a China shop around the corner and got one for just seven! And it has two USB ports, so I could charge my and someone else’s device at once, which came in handy a few times. Because it already has the European style two-prong plug, I didn’t need an adaptor. 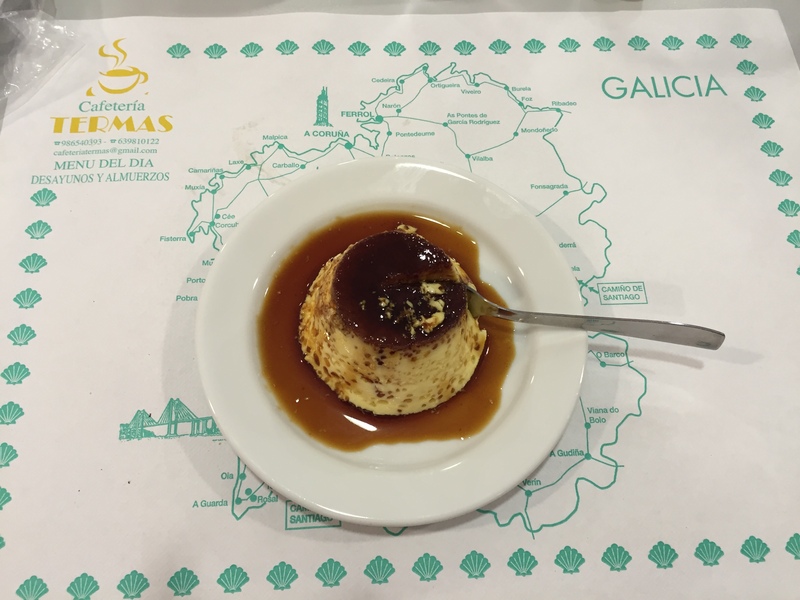 This will be with me on my next Camino for sure! Once again, the Camino provided. 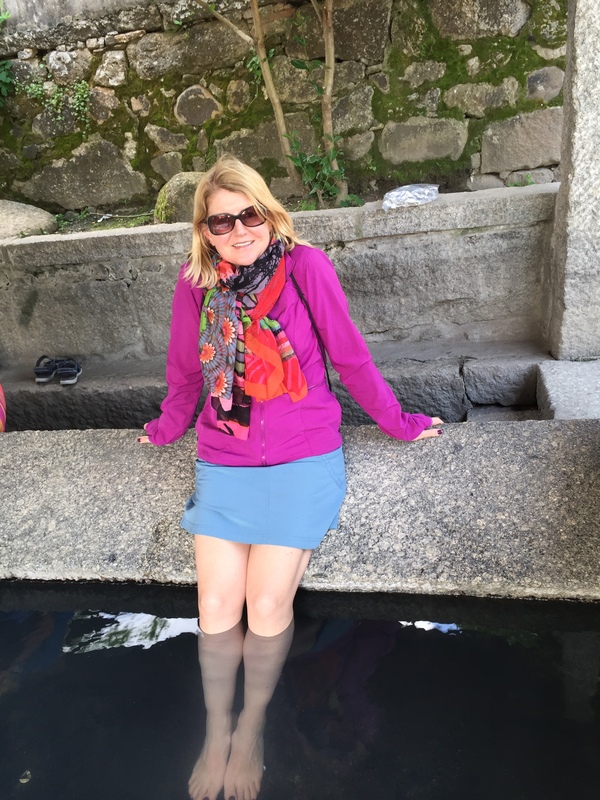 Later I strolled along the river and found the hot springs that Caldas de Reis is known for. 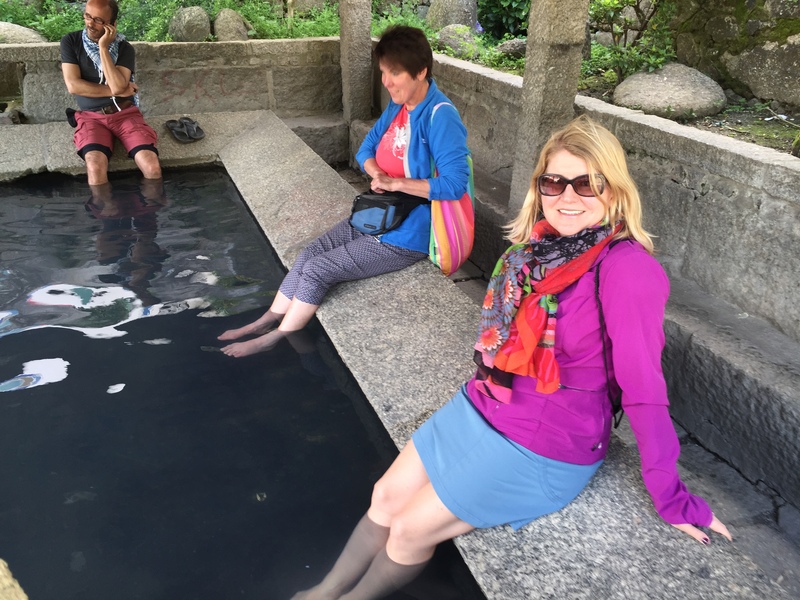 The natural hot springs water is said to have healing properties. As I put my legs in, it felt so incredible after walking all day. I am glad I didn’t have blisters because that probably would have stung. Maybe that’s why a few peregrinos were hovering around the pools but not getting in. I found out later that there is a hotel that has individual tubs in each room that you can soak your entire body in the hot springs water in the privacy of your own room. Jesus and his albergue are nice and all, but if I pass through this town again, I’ll be staying at Hotel Davila. I was well fed and relaxed by the time I got in my top bunk, this time above a Brazilian man. 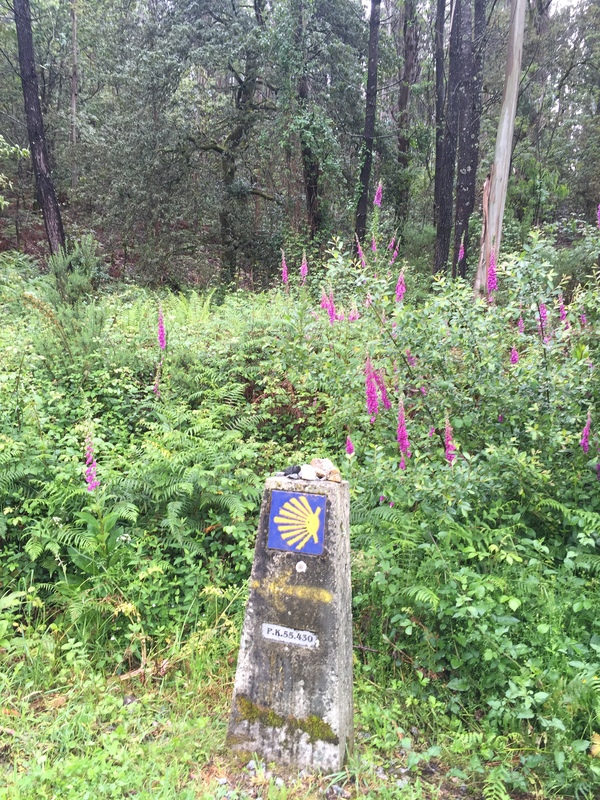 Single ladies, take note: men outnumber women on the Camino and they are in good shape. Just putting that out there. 😉 There’s something amusing about sleeping over a different man every night on the Camino. Just remember those earplugs! 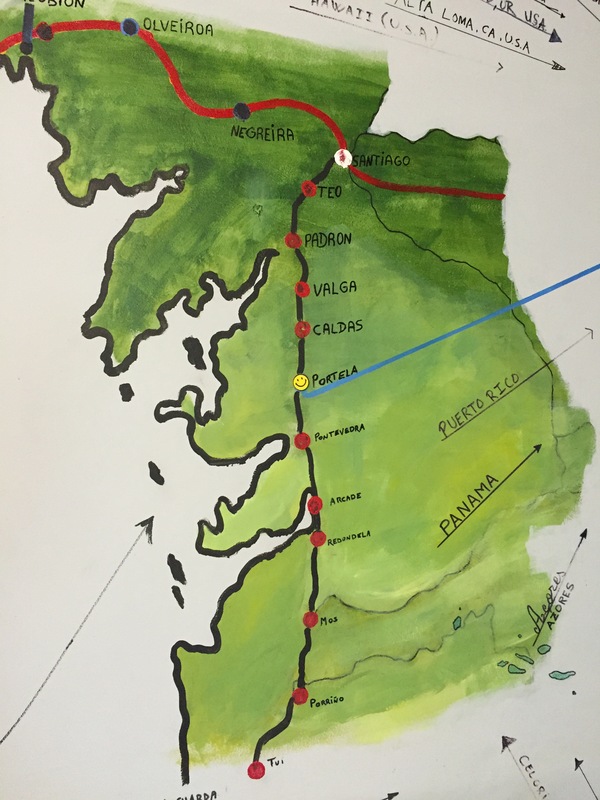 Up next, Caldas de Reis to Padrón. What percentage of those men are gay? Haha. I’m hoping the Camino provides for me next week! Buen camino retrasado and looking forward to the next entry!